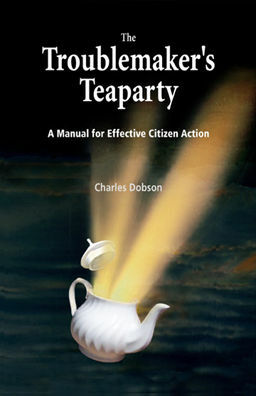 The possibilities for environmental projects are too numerous to cover adequately in the context of this handbook. Here are just a few examples. 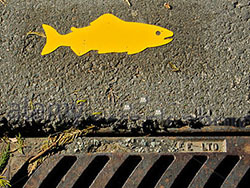 Painted yellow salmon now decorate some of the catch-basins of Vancouver, to remind us that what we put into our storm sewers eventually ends up in our oceans. A program administered locally through the City's Environmental Protection Branch, it encourages people to paint the salmon by providing a kit containing a video, instruction manual, latex paint and template, and a reflective vest; as well as leaflets to distribute throughout the neighbourhood. The long term goal is to mark all 30,000 of the city's catch-basins. Although geared to school age children, the project can be undertaken by any person or group. One of the easiest and most effective ways of addressing climate change is to improve the thermal performance of buildings. The savings in heating costs cover the cost of improvements over a relatively short period of time. But most home-owners people don't realize that their houses are inefficient, and where heat is being lost. 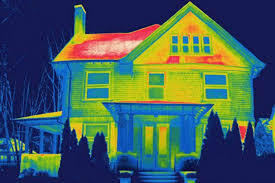 A thermal image makes heat loss visible. Thermal imaging cameras, such as those made by FLIR, are expensive are require training in their use, but the impact of the photographs is remarkable. One US city became a model of energy efficiency after supplying thermal images to home-owners. With a little training local residents can work with town or city governments to take images of houses and provide the results to home-owners. Many west-coast environmental groups have been involved in projects to clean up and restore urban streams and shore lines. Projects usually begin by identifying a stream that once allowed salmon to spawn. Working with the federal department of fisheries residents clean up the stream, reintroduce indigenous plants, and eventually transplant fertilized eggs purchased from a local hatchery. Stream restoration projects create great sense of pride amongst residents. Bird habitat projects focus on restoring local habitat to bring back birds that have disappeared from an area . A project might include planting native seed-bearing plants in parks and lanes, or building birdhouses designed to attract a particular species. Bird habitat projects are good venues for bringing kids, parents, and community activists together. In traditional communities, harvesting was an activity that brought everyone together. In modern cities a version of this has reappeared in the form of cooperative gleaning, usually focused on the harvesting of fruit that would otherwise be left to rot. We build communities and strengthen food security using local backyard fruit. We connect people who have excess fruit from their backyard fruit trees with those who have the time and energy to harvest it. Most of the harvested fruit is donated to community organizations and individuals in need. We also offer canning and pruning workshops to pass on skills which are quickly being lost in our urban environment. People become involved as volunteers who contribute to picking fruit, distributing fruit, or training people to care for fruit trees. Others become involved as donors of backyard fruit. Still others contribute tripod ladders, pruning gear, and canning equipment. The harvesting projects can go awry if they focus too heavily on the quantity of food gathered. The best projects focus on having fun and doing something productive with others who live nearby. River guardians look after a river by regularly walking a stretch of riverbank. Sometimes they do water tests, sometimes they report suspicious discharges to authorities. Different people looking out for different stretches of water can keep an eye on a river hundreds of miles long, something that would be impossibly expensive for government to do alone. A stewardship society usually trains volunteers and tries to make sure it has all the critical stretches covered. Guarding rivers has many spin-off benefits. When seniors participate they feel they can still make a worthwhile contribution to society. For others the project fits nicely into everyday life as part of a daily walk. And if each stretch of river is covered by two people or two families, it helps to build community by establishing regular contact between people. For more information on river guarding, check out the website of the Willamette Riverkeeper in Oregon.